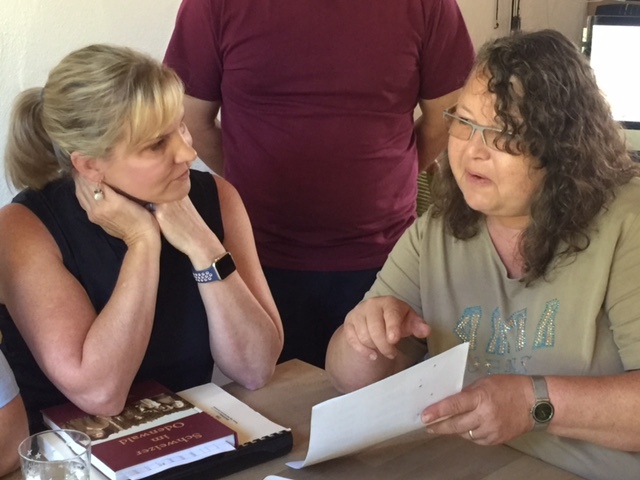 Michelle Frumin (left) meets with Andrea Kindelberger, Rumbach, who is the local genealogist with much information on families from this small town in Rheinland-Pfalz. 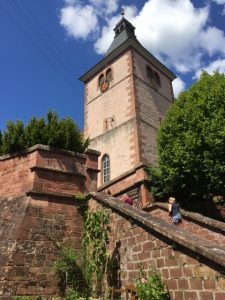 Michelle Frumin had long wanted to visit her ancestral villages in Germany, Alsace and England. So it was a very exciting day when we entered Rumbach, Germany on the morning of August 6. Waiting for us with open arms was Andrea Kindelberger, a local historian and genealogist who we soon found out was Michelle’s cousin, six times removed. Much information was shared and then we had a fun walk around the village, with Andrea pointing out two ancestral houses. 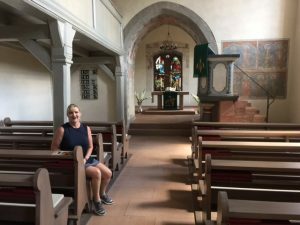 We also enjoyed the beautiful and very old farmhouses in the center of the village, and Andrea told us that the town had received official recognition from the government in Berlin as being one of the most progressive, forward-looking and vibrant villages in Germany. 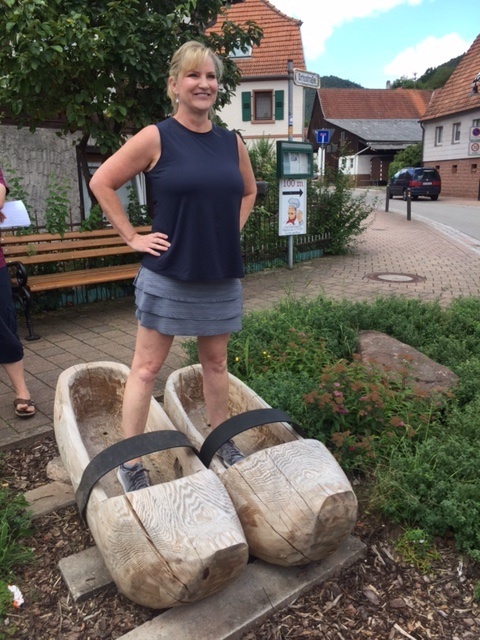 Michelle stands in a pair of oversized wooden shoes. This had special meaning for Michelle, because her grandmother brought back a pair of wooden shoes from Germany many years ago, which she painted with windmills. Michelle received those as a girl. Ken stands by a village fountain. 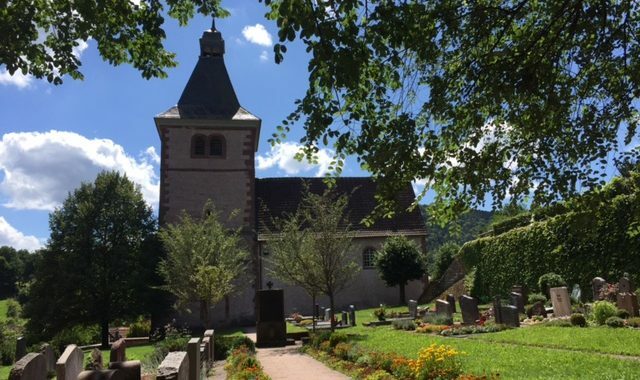 One of the highlights of our visit to Rumbach was the visit to the 1,000 year-old church of St. Gangolf. The church waa built as a Catholic Church, and the village was long a stop for pilgrims who would have their horses blessed as they made their way to various religious sites in the area. When Rumbach joined the Reformation the church interior was whitewashed, and the precious old frescoes were covered. They remained covered for hundreds of years, only recently being rediscovered. 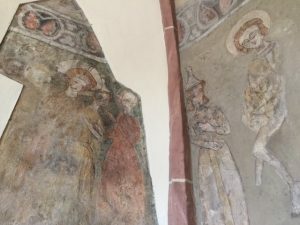 That whitewash helped to preserve the murals, which are now being paintstakingly uncovered. St. Gangolf, the church which is 1,000 years old at the center of the village. 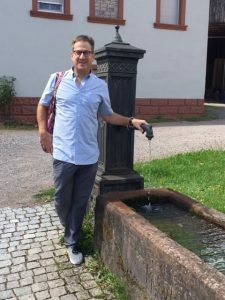 Research assistance in advance of our trip was done by Roland Geiger, who is an expert researcher based in St. Wendel, Saarland. 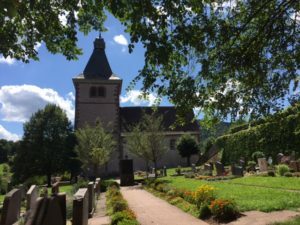 Posted in Family History Tours and tagged family, frumin, geiger, genealogy, germany, history, in, kindelberger, pfalz, private, rheinland, roland, rumbach, tours.